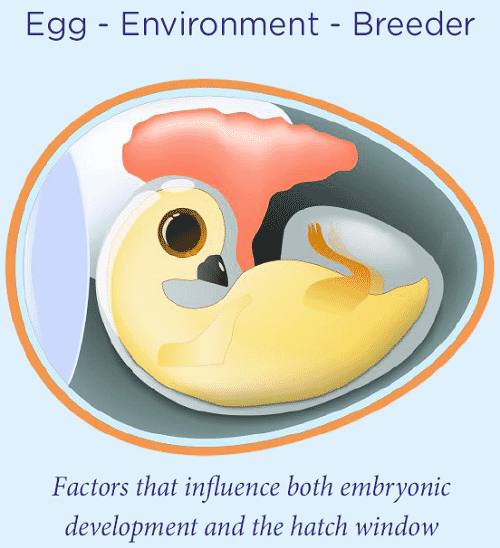 The hatch window is defined as the period between the beginning of active hatch of the first chicks and the last chicks in a hatcher, after transfer. When this is formed, a normal graph is observed as a Gaussian function. The hatch window provides information that is useful in determining the optimal duration of the incubation process. With the hatch window the following can be observed: A. The peak of the hatch in relation to the pull time, which allows the optimal incubation time to be adjusted and B. The total duration. That helps to determine chick uniformity and quality. The traditional method for determining the duration of the hatch window is to open the hatcher and verify the number of chicks hatched at different intervals (Pictured below). This practice allows for good information; yet it is only representative of the exact time in which the chicks are counted, and is also limited to only a few baskets. Furthermore, it takes work and time disrupting the hatcher environment due to opening the door and removing the baskets. A monitoring system allows for observation of the hatch window without having to disturb the environment and without additional work. Information is obtained in real time, through a wet bulb probe that shows the hatch window after approximately 5% of the chicks have hatched because the humidity in the machine environment increases in measure as the process advances. Take into account that the embryos don't stop their embryonic development, but reduce the growth rate to “physiolgical zero” when they are stored in the cool room. Because of this, before the incubation process, the egg should be handled correctly in the breeder farm, in their cool room (in the case that one exists) and while being transported from the breeder farm to the hatchery (check that the temperature isn't too cold, that there's good insulation in the trailer and monitor the temperature as much as possible during transportation). Also, the equipment of the cool room at the hatchery should be checked to make sure there are no obstructions in the airflow. This should be organized with the eggs classified and marked according to genetic line, the lot and the storage date. Also, the quality of the eggs must be screened to notify the personnel of the breeders in case of any abnormality. Doing the proper procedures prior to incubation helps the eggs to be in a state of embryonic development similar to the beginning of the process.